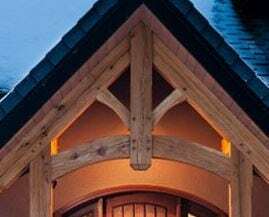 Beauty, strength, and detail—these are the hallmarks of traditional timber framing. Comprised of joints and connections developed centuries ago, these methods of construction are still employed today. 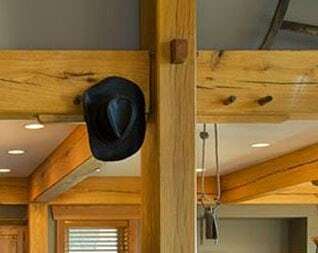 From hand tools and chisels, to the modern precision machinery, a timber frame’s connections not only provide an enduring framework, but they integrate with the beauty of the home itself. Let’s review and define some of the interesting joinery types used today. Mortise & Tenon—Primary construction for our homes is comprised of mortise and tenon joinery. For those who may not know what this type of connection is, it is created by inserting a timber piece with a tenon into the mortise hole of its adjoining piece. These two components, the tenon and mortise, are cut to fit together perfectly. The joint is then secured by wooden pegs, driven into the connection itself, which not only holds the joint secure, but also provides a beautifully artistic look and feel. 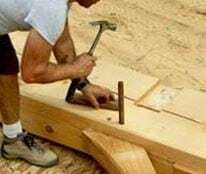 Through Tenon—The through tenon is often used when more distance is needed between the pegs in a specific joint connection. The tenon passes all the way through a mortise to the other side of the exposed beam. This joint offers both efficiency and an intrinsically unique design from the typical mortise and tenon construction. Splines—A common occurrence in timber frame construction happens when two beams meet at the same post on the same plane. This does not leave enough cross sectional width for each to utilize a tenon. When this happens, a spline is passed through the center beam’s mortise hole and the open mortise on each supporting beam is then able to slide around the spline. From there the whole joint is secured with the insertion of pegs. Knee Braces—Knee braces can come in different designs, shapes, and sizes, but their primary function is to provide rigidity to the frame wherever any major timber posts and beams may come together. You may choose to have your knee braces stand out in a more decorative manor, or to blend more discreetly with the rest of the wood connections. Discuss your options and what would look best with your home’s designer. Trusses—Timber trusses are triangular structures that span the inner roof ridges of the home. 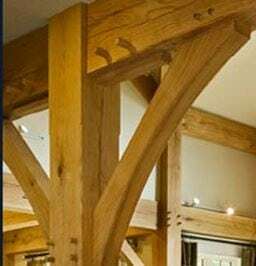 This type of joinery not only allows smaller sized timbers to cross large expanses, but they are the traditional timber frame’s signature feature most people are drawn too. From the rounded barrel truss, to the impressive king post truss, to the contemporary look of the scissor truss, the design for your truss system can greatly impact how your home’s frame interacts and beautifies the rest of your design.